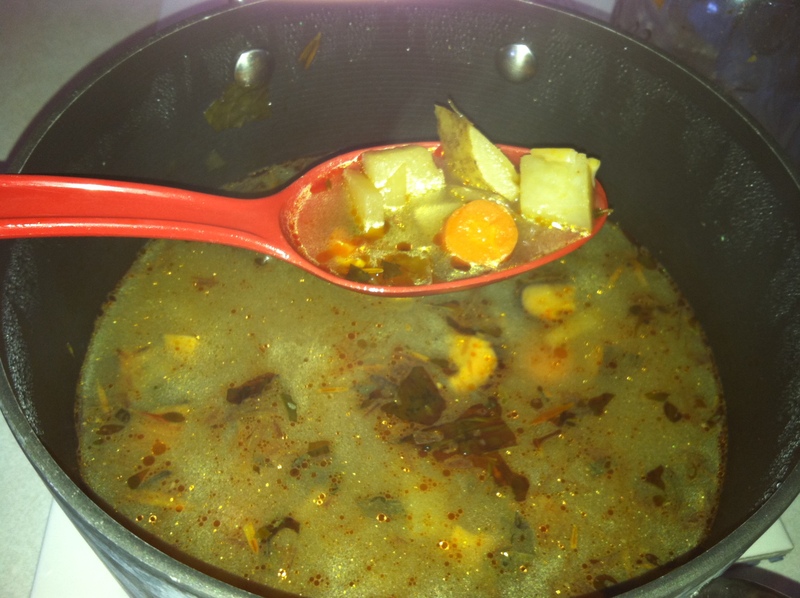 The following recipe is for a medicinal chicken bone marrow soup made with herbs. The selected herbs are great immune boosters and prevent many sicknesses. When making your soup stock, it’s wise to make a double batch so you can freeze some of it to have on hand for the next soup you make. 2) Put the cut up leg pieces and or the chicken carcass into the water. Add all ingredients, bring this to a boil then turn down and let simmer for four to eight hours. . This entry was posted on Monday, January 21st, 2013 at 7:18 pm	and is filed under Anti-Inflammatory, Asian Herbs & Foods, Immune Booster, Kidney Tonics, Soups & Stews, Warming. You can follow any responses to this entry through the RSS 2.0 feed. You can leave a response, or trackback from your own site. It was very delicious! Maybe someone will make it for their project in the Herbs II class this trimester, then we can all taste it. It would be nice to add a handful of Goji Berries to the recipe for the broth. I am definitely making this soup, it sounds wonderful! Thanks for the compliments on the soup! It was yummy! Thanks also to Lana for her help and suggestions! Hey, this is the same thing i made at home last night when a friend said he was sick. The only thing i didn’t put in it was the astragalus (none at home). I had no idea this was the same recipe. I used kelp noodles however instead of potatoes. Sounds great! Where did you buy the kelp noodles? I make a version of this soup almost every week. Since I am an earth deficient kind of person I have to say I have found no better food for breakfast than this soup. I will have to begin to add some appropriate herbs to strengthen it’s healing abilities. Am really happy that I got to experience Heidi’s Medicinal Chicken Soup with Herbs in Lana’s class. When I make it, I think I’ll use buckwheat groats in place of potatoes. They digest easily for me and I actually have some at home. I make this chicken stock almost every week and use it as a base for various soups. The chicken becomes all sorts of other recipes! A couple of things I do to make it easier on myself it to cook the whole chicken in the crock pot. Once the chicken is cooked and I remove it; the bones and drippings are all left over in the crock pot and makes the stock process very easy! Also after I cut up the chicken bones I let them sit in vinegar for about an hour before I add the additional water and ingredients for the stock. The vinegar is supposed to help leach out the marrow from the bones. I just made this soup on Sat for one of our massage therapist at work who’s been feeling tired and fatique plus feeling like she’s catching a cold . I filled the soup with extra garlic , ginger , parsely ( acts as antibiotic ) , and cinnamon , fresh lemon . She called me this morning to say , she’s never felt so good and energized . She ate it for two days and again this morning for breakfast . Great way of natural healing . Great soup , you could also add Parsely and lots of cinnamon to it for faster healing. I make chicken soups all the time. Next time I am definitely going to try this recipe. I haven’t cooked with shiitake yet, so this recipe will be my first time. Excited! This sounds like a really delicious and nurturing soup – Chicken Soup for the Hun? Can’t wait to try it! Love the garlic, lemon and ginger, especially, along with the shitake mushrooms. This is a perfect time to be learning all of these medicinal soup recipes. Freezing the stock is a great idea. Especially when you’re cooking for one. I just discovered I have some left over shitake mushrooms, and all the other ingredients to make this soup today. Sounds yummy! Hopefully it’ll be a good boost for my studies this week. I will admint I do not like January. bronchitis every January?? Maybe because is a long and gray month? and finally I am feeling much better..Thank you the organic soup and herbs they are the answer. When is the next class ?? where can I see your class schedule?? Hello there, simply became conscious of your blog through Google, and found that it’s really informative. I’ll be grateful in the event you continue this in future. A lot of men and women will profit from your writing. Cheers!